Mimi Semuha, originally from America, has lived and worked in Israel since 1961. She moved to Safed from Rishon LeZion, and has recently retired from her work with autistic children. Being the doing type, in the early 80's she set up what became the National Organization for Teachers in Autistic Education. This enabled teachers of autistic children to get together and compare notes, exchange ideas and help to improve what was available to these children. With her retirement, Mimi looked for something meaningful to do in addition to her private work as a consultant in autism. Walking her dog around Safed every day, Mimi saw that there were a lot of things that could be improved. Coming from America, she is much more environmentally aware than some of the old timers in Safed who have a somewhat more fatalistic "what can you do?" attitude about life. Mimi decided that "something needs to be done" to counteract the acceptance of the street litter and the general lack of pride in the city by many of its inhabitants. She decided to set up the Peninat HaGalil organization to help improve and beautify the town, protect its green spaces, and campaign on the environmental issues affecting Safed residents. With a mailing list of over 500, the organization was very active during the recent local elections, holding a public meeting at the Yigal Allon Center to address the issues involved. She believes that this meeting, and the organization as a whole, was influential in helping to elect the most promising of the mayoral candidates, Ilan Shochet, who said he would help to develop and beautify the city. The organization is campaigning on a variety of issues including probably the most important issue that affects a majority of Safed residents. This is the possible loss of the local public swimming pool which is under threat from the developers. 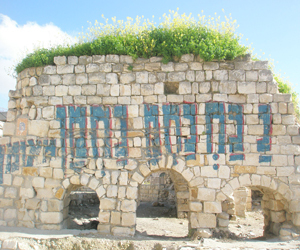 The Emek Hatchelet is the only public open-air swimming pool in Safed and is set in a beautiful nature reserve. It is the only green place in Safed where whole families can go and spend the day in nature without having to leave the city. Summer day camps also take the children there to enjoy the pool and play under the trees. Under a previous mayor, the land was sold to help pay off some municipal debts and a high density housing complex has been proposed on the site. Lawyers believe that there is a good case to save the Emek, as there are some questions regarding the legality of the sale. They can also argue the need to protect this vital city resource and its nature reserve on environmental grounds. Peninat HaGalil has taken on this issue and is fighting the case in the courts with the help of the Adam Teva V'din, a national organization which fights to save natural resources. As well as campaigning for the Emek, collecting hundreds of signatures on petitions, getting written objections to the building proposals and generating publicity, Peninat HaGalil sends observers to the municipal council meetings. They were also instrumental in getting a new municipal environmental committee set up, on which they have representation. They send photos and information on environmental issues on what needs to be done to the local paper and report on improvements as they happen.